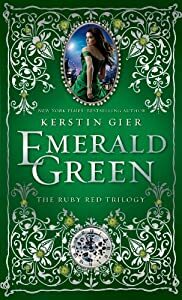 It’s a *cough* green letter day for those of us who have been “patiently” awaiting the announcement of the release date for the final installment in Kerstin Gier’s Ruby Red trilogy. In case you haven’t read it (and you really, really should), Ms. Gier is German and writes in German and publishes in Germany, so we have to wait for the super-talented Anthea Bell to translate Ms. Gier’s fab Deutch auf Englisch. So while Emerald Green has been released and devoured and loved everywhere from Munich to Hamburg and Düsseldorf to Dresden, it has yet to reach our shores. According to Amazon.com, Emerald Green will be released in the US on October 8, 2013. So get your pre-order on, take off work, and we’ll have a read-a-thon and drink hot chocolate and eat scones and tweet spoilers. Oh, don’t get your powdered wig in a twist…I was just kidding about that last part. Who’s with me? We’ll have our own hashtag: #EmeraldGreenDay and it will be Tré Cool, ‘k? Does anyone know when it will be available in Canada? Someone left a comment on another of my posts back in March saying that it was being released in Canada on October 8th. I do not know where she got this information, but I would assume it would be released on the same date as in the US?